WordPress recently announced that “all new or updated code released into WordPress core and bundled themes must conform with the WCAG 2.0 guidelines at level AA.” This means WordPress will be making the product more accessible with every new update. Rian Rietveld’s article WordPress goes WCAG clearly reflects her enthusiasm about this step forward in terms of accessibility. 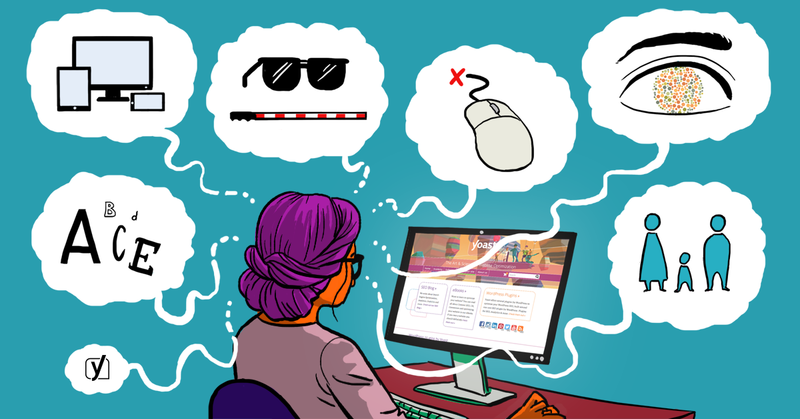 Before we dive in, if you want to learn more about accessibility and other essential SEO skills, you should check out our All-around SEO training! It doesn’t just tell you about SEO: it makes sure you know how to put these skills into actual practice!! For us plugin developers, Rian makes a clear statement: “The accessibility of plugins is the responsibility of each plugin author.” In our book, that means you can’t just ignore accessibility altogether, because you don’t like to focus on it. In this post, I’d like to illustrate what this responsibility means to us. I’m not a code writer myself but have seen my share of plugin code over the last several years. Some are well coded, some are ‘poor’ coded. And by poor, I mean that some drawings by two-year-old kids have more structure than the code of those plugins. Write clean code, it’s as simple as that. It will make sure screen readers and tools like that will do a better job. It will make a site more accessible. At Yoast, we don’t take this lightly. We have a well-thought-out code design and development process, which contains a lot of feedback moments. That feedback comes from colleagues and for instance from beta testers. It’s our and your responsibility as a plugin developer to make sure you’re not just outputting code. You have to make sure that you’re outputting clean code. Running your code through the W3C Validator every once in a while already helps you determine if you’re writing clean code. Usually, the recommendations this validator gives you, are easy to fix. And they might already make a huge difference in term of accessibility. 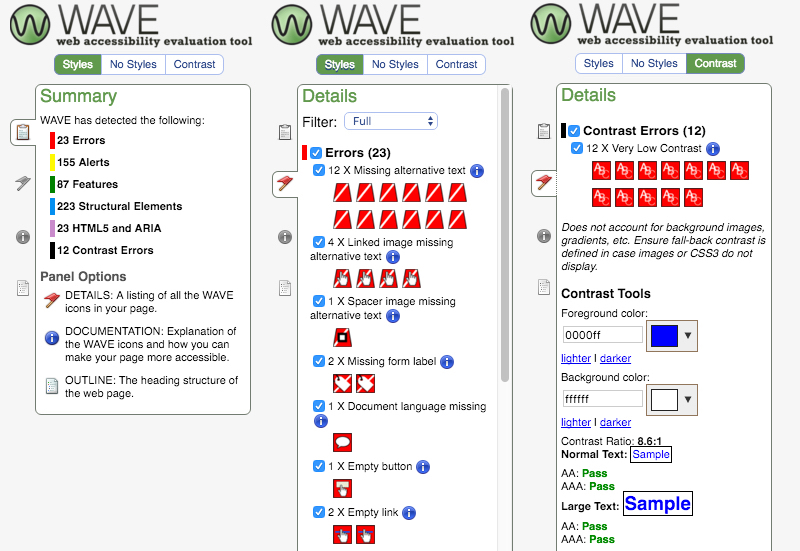 The WAVE extension analyses a variety of possible accessibility issues. In the screenshot above, you can see things like missing ALT attributes and contrast issues. And how about adding these labels to your forms? It’s all not that hard. This WAVE analysis is all done in seconds and really tells you where your code (or website) should be improved for accessibility. Contrast is also something that’s really easy to test and improve. Simply use WAVE or Lea Verou’s contrast ratio tool. No need to do that on a live website, as we’re talking about your plugin’s user interface here. Please go read my post on easy-to-use accessibility tools for more testing tools. You were thinking just that, right? Our plugin isn’t perfect either, in terms of accessibility. But we have shown to you over the last years that we’re listening and we’re improving accessibility at a fast pace. Just the other week, we took that to the next level by hiring Andrea Fercia full-time. Andrea specializes in accessibility. He’ll also be dedicating a portion of his time to core, by the way. Andrea is well-known in the WordPress community. 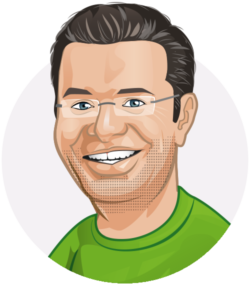 He is the team lead for the accessibility team for WordPress when it comes to core. We’re very happy to have you on board, Andrea. I am sure we’ll be making our plugin(s) even more accessible thanks to your knowledge and experience! I guess that’s what Rian meant when she wrote: “The accessibility of plugins is the responsibility of each plugin author.” As the plugin author of one of the most-used WordPress plugins, we hope we can set an example in this! Even I have never heard about this plugin but after viewing the above picture of the tool gives me an idea that it will be good for On-Page Optimization. Thanks for telling about WAVE Extension. I never heard about this plugin but I’m going to give a try this to plugin hope it optimize my website. i now use wordpress plugin. it is usefull and helpfull. i like this. after update, it is easier for user. Thank you for telling people about WAVE. The wave site itself is a great tool as well, but is unable to crawl secure SSL cert sites. Keep up the great work! I hope you will address tier 2 domain names soon. Seems to be quite a bit of confusion out there.